Advertising Week is a whirlwind annual conference that draws 90,000 marketing professionals who work at agencies, media companies and corporations from here and abroad. They share best practices, discuss trends, discover the latest technology, and trade winning tactics across of variety of platforms all designed to woo you. The preeminent question of every session is: How do we make grab your attention, make an impression, move you to purchase, and gain your loyalty? Yes, that is one question. The sales funnel, in its most basic form, is comprised of awareness, interest, consideration, and purchase. Advertising Week itself proved an interesting case study to see how marketers market to marketers. Here is a sampling of my favorite executions by the sponsors #AWXI. – Adobe: This software and marketing services company had a pervasive presence on site and online, promoting the Adobe Marketing Cloud through three videos. They used humor to make a serious point: Do you know what your marketing is doing? I can watch all these videos repeatedly, but my favorite is “Click, Baby, Click!” It’s the most dramatic example of the horrors of not taking a holistic approach to digital marketing. Go on, indulge yourself: “Mean Streets: Wife” and “Woo Woo.” Hilarious and smart. – Neustar: This company ties user data to trackable behavior so marketers can target and personalize messaging. One method of doing this is tying Verizon customer data (phone number, address, device) to behavior on a variety of platforms and devices. 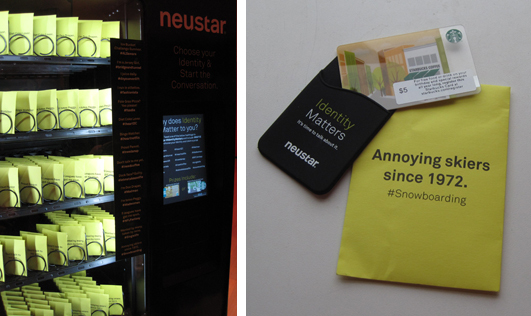 Accuracy and scale are their expertise and the #IdentityMatters campaign was promoted in through a clever exhibit at The Times Center: A vending machine dispensed $5 gift cards based on personas. The gift was triggered by posting a tweet with their tags, a self-selected hashtag to pick your persona, and a unique code. 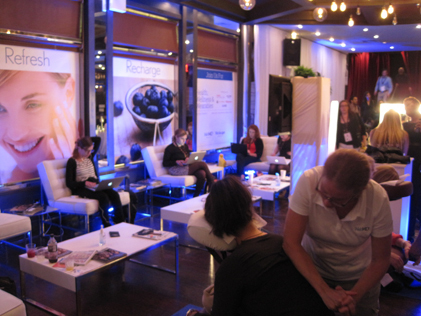 – LinkedIn: The business social net had an “INspiration Lounge” to promote their #INspireAWXI campaign. Apparently, “Professionals come to LinkedIn for inspiration,” as one of the tabletop cards read. The lounge wasn’t much more than a TweetWall (large electronic display showing live tweets from the event), places to sit, and branded freebies. I do like my LinkedIn pen, but not as much as I enjoyed the happy hour they sponsored two years ago; it featured a free head shot, taken by a professional photographer, to post as your LinkedIn profile image. And there a hair and makeup team was available for pre-photo primping. – Marketo: Like LinkedIn, this company is one of the early winners in social media and everyone knows about them so their exhibit was a smaller version of LinkedIn (screen, seats, reps). Their marketing software is designed to help you launch, manage and optimize your digital marketing efforts. And they are masters of how to successfully use content marketing — check out their resources. – YP: What started as the Yellow Pages phone book is now the largest local advertising platform, courtesy of AT&T. To illustrate their local marketing capabilities, YP’s display at #AWXI featured a local list of restaurants (highlighting their partnership with OpenTable). And, more deliciously, offered free treats from local purveyors: a mini soft pretzel from Sigmund’s Pretzels, mini Rice Krispie-style bits from Treat House, and a mini black and white cookie from Zaro’s. – WebMD: Wow. The company’s medium was the message: Relax. Refresh. Recharge. A spa experience was recreated in the bustling foyer of The Liberty Theater on 42nd St. Sure there was noise and crowds as attendees lined up for the next #AWXI session, talked on their cell phones and opened their laptops to catch up on email. But the chilled watermelon juice, free manicure with skin analysis, and chair massage were a welcome oasis for a constant flow of marketers hustling between sessions. The parting gift of the free yoga mat in a sailbag from SeaBags pushed this exhibit — this experience — over the top. Posted in Digital Strategy, Engagement, Newsworthy and tagged Adobe, Advertising Week, AWXI, content marketing, LinkedIN, marketing, WebMD.